Hello, November! The sky is cloudy, and precipitation of some kind or another (depending on the forecaster) is in the future. I've been scouring the local online ads for a snowblower. After extensive research, I located just the one for us. I texted the seller, and agreed on a time for John and I to meet him. Later in the day, I texted again to verify, and was told another interested party would be seeing the snowblower at the same time. At that point, I informed the seller I would pass, as I didn't want to get caught up in a bidding war, and I didn't want to drive the distance to see the snowblower if we weren't going to be able to purchase it. I also didn't think it was fair to the other party to be stuck in the same position. Later that night, I received another text from the seller, informing me that I didn't show up (I already had told him I wouldn't), and that the other party didn't either. The wording of his text was grandiose and designed to make me feel small. It didn't work. I took a few minutes and told John all the clever responses I could come up with (but didn't type any reply), laughed a bit, then enjoyed the rest of our evening. 1. I'm thankful we didn't buy the snowblower from the bully. Last night, John's parents called. They did not know that we were looking for a snowblower. They didn't know that we had been in communication with that guy. John's dad asked John if he would like a snowblower. John's dad recently purchased a new one, and was looking to get rid of his old, but perfectly functional, snowblower. John laughed, readily accepted the generous offer, and then explained what had happened just the day before. 2. I'm thankful that John's dad offered to give us his old snowblower. 3. I'm thankful that life works like that. Call it karma, or "What goes around, comes around," or "With what measure you mete, it shall be measured to you again," but I'm glad that life returns what you give. I refrained from actually replying back with the zingers that I was composing and sharing with John, and our need was met. I spent some time at our new-to-us house this past week. The previous week, we had a range delivered. The day after it was delivered, it was beeping and flashing an error message. When I called the customer service line, I was told the error message indicated something was wrong with the electronic board, and that I had a choice between getting a repairman or having a new range delivered. Of course, I opted for the new range. 4. I'm thankful for an easy exchange. I'm hoping the first stove was just a lemon, and that the replacement will not have the same issue. So far, so good. Another morning, I met the roofer for a few easy repairs of little problems that had surfaced during our pre-purchase inspection. 5. I'm thankful for skilled workers who can easily and affordably fix things. While the roofer was working, I touched up some areas on outside door frames where the paint had faded or chipped away. 6. I'm thankful to be getting projects done prior to moving in. The evening of the snow blower incident, John and I headed up to the new neighborhood to attend a get-together with our neighbors. It's going to take me some time to remember all the names, but everyone seemed very nice and we had a nice time meeting our neighbors. 7. I'm thankful for friendly welcomes. This past week wrapped up another year for John, and he celebrated a birthday yesterday. We (John, youngest daughter, and I) ate dinner at Four Seasons Hot Pot and Dumpling, which was a fun experience. A hot pot of broth sat on a hotplate on the table, and we could choose what to put in it. It cooked at the table, and we were encouraged to keep adding more and more to the broth. We left stuffed! 8. I'm thankful for apps and social media sites that make researching restaurants easy. After dinner, we took part in Art Walk, which is held the first Friday of each month in Provo. We didn't actually know ahead of time where the shops were that were participating, so we didn't see many signs and only ended up wandering into one art gallery, but it was interesting anyway. We couldn't pass up going inside a local pet store, even though it wasn't officially part of the art walk. They had an extensive aquarium section, and quite a few reptiles as well. I just had to take a picture of the baby bearded dragons. 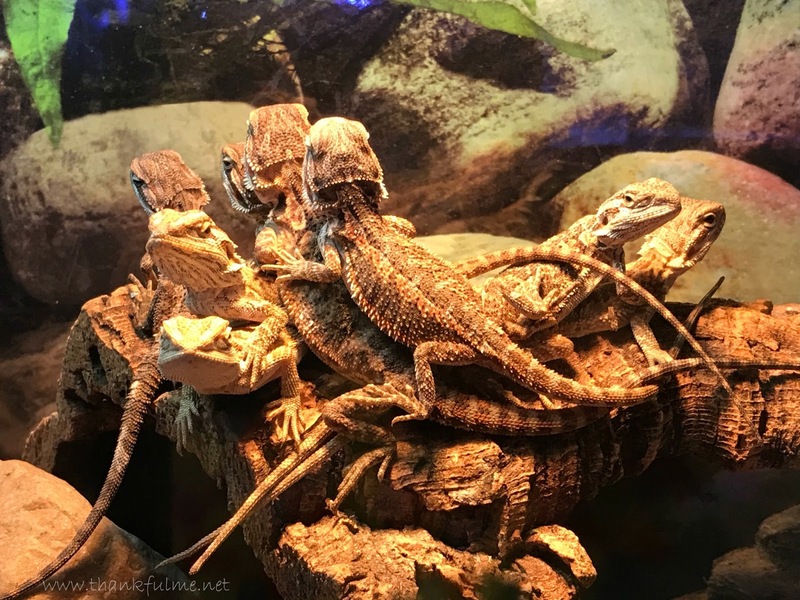 Photo: Eight baby bearded dragons pile on top of each other, facing all directions. After our walk, we drove to a dessert place (The Chocolate, which had other flavors available) where we each enjoyed a slice of cake with some ice cream. 9. I'm thankful for fun family evenings. 10. I'm thankful for John. We are not as old as the birthdays would indicate, but I welcome those markers that prove we have had more time together. Years ago, we would have thought people of our age were old. We know better now, but I do look forward to growing old together. Of course, our idea of what that looks like is different than we would have imagined in our younger days. We will be running more races, and hopefully longer distances. We will be hiking the mountains behind our home. Whatever else we decide to do, we will do with a sense of adventure and enjoyment, because that is how we choose to live. Happy birthday, John! I love you! How was your week? Did you deal with bullies or celebrate birthdays? I'd love to hear what you are thankful for this week! Comment below, and as always, please consider writing your own post and linking it up at the Ten Things of Thankful blog! I am thankful that a friend and I were able to travel through a snow storm and arrive at our retreat destination. I was praying every mile we were on the snow covered roads. Traveling in snow can be nerve-wracking! I'm a bit nervous about the roads here, especially near our new house. I imagine there will be times when I will choose to stay home rather than venture out on the hilly streets. I'm glad you made it to your destination safely. (one of the things) that I like most about your blog posts are the examples of the (fill in the blank) that is a part of every day life, if we are willing to choose to see it that way. most people call them 'coincidences' but most people (imo) deprive themselves of the opportunity to see how much more there is to life than the things we touch or feel, the things we do or have done to us. and so, your choice to not respond to the bully is a choice that a large percentage of people (imo) have difficulty making, which is cool. but... but! you take advantage of the the situation and use it to reinforce and build your ability to see life that way and that, I'm confident is well beyond the purview of many people. (never been sure why it's so difficult for people to admit to seeing the force of (fill in the blank) in their everyday lives, I suspect they don't want to risk being pointed at as being odd, or worse, silly. You might find this talk interesting: https://www.lds.org/general-conference/2005/04/the-tender-mercies-of-the-lord?lang=eng. It explores just the idea you mention, that the seeming-coincidences of life are evidence of a loving God who is intimately involved in the details of our lives. I think you are right that people don't want to be thought of as odd or silly. I also imagine that it is "easier" to view these experiences as coincidence, because to do otherwise would be to acknowledge something bigger than oneself, and with that knowledge comes re-evaluation of what that means individually--what is one's responsibility to that benevolent Being? It's no longer adequate to carry on as before once one recognizes the many tender mercies that are given. I am proud of both of you for number 1. That's "adulting" there. Have a good week. Thanks. Hope you have a good week, too! There's nothing worse than a snowblower bully. Good for you for being the bigger person. Happy Birthday to John! I am glad you got your snowblower, that is nice how it worked out.